Last December I visited Chester, and on a cold and very wet Sunday lunchtime, we traipsed around looking for somewhere to have breakfast. It was nearly lunchtime so we opted to go for somewhere serving breakfast and lunch, and headed for Hickory’s Smokehouse, which is an American /barbeque type restaurant. The menu is fairly comprehensive and very American as promised. We started with milkshakes and root beer floats! 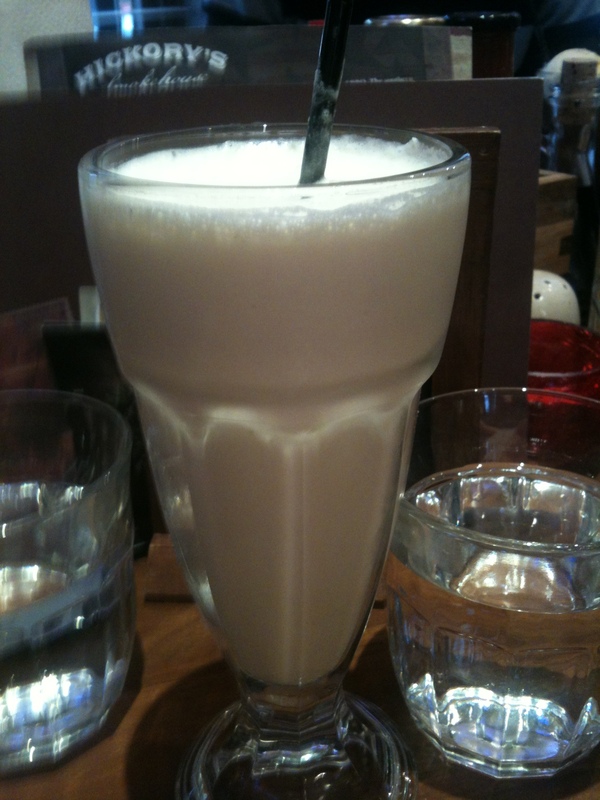 I had a vanilla milkshake which was thick, indulgent and yummy. Emma got a float with ice cream! All the milkshakes were £3.50 which is at the top end of what I would consider reasonable. They do some great other flavours, such as Key Lime Pie, chunky monkey and triple chocolate! 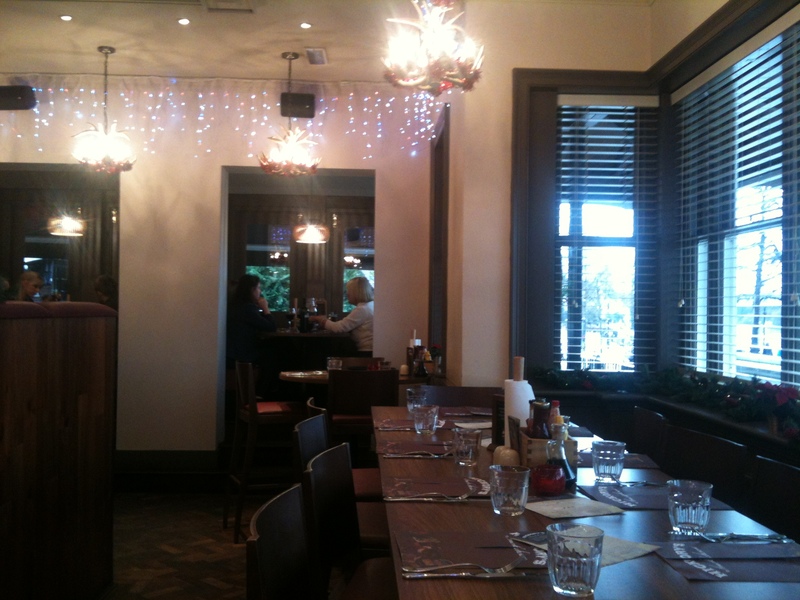 Here’s a pretty terrible picture of the inside of the restaurant (sparkly lights for Christmas!). It had large booths and great views of the river. 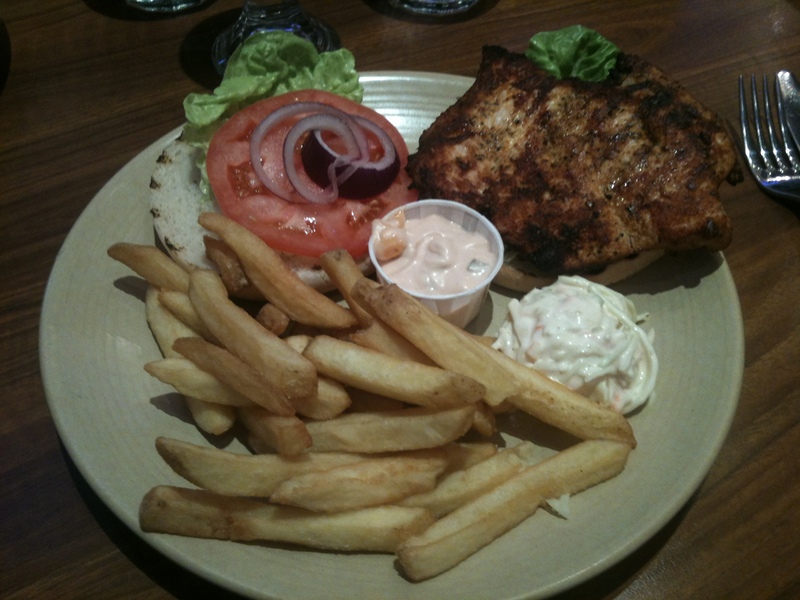 I debated between a breakfast choice and a lunch choice for a while, and eventually decided on the chicken burger with fries, coleslaw and chipotle mayo. It was good but not exceptional. 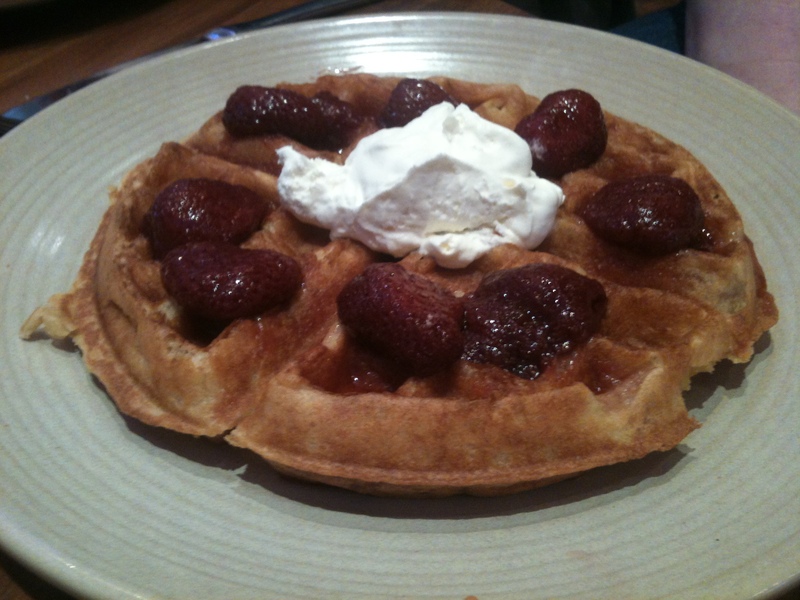 Emma went for the breakfast option, getting the waffle with strawberries and cream. How yummy does this look! And Lee got a regular burger with fries, I gather that he must have really enjoyed it given that he ate all of his plus some of my chicken burger! 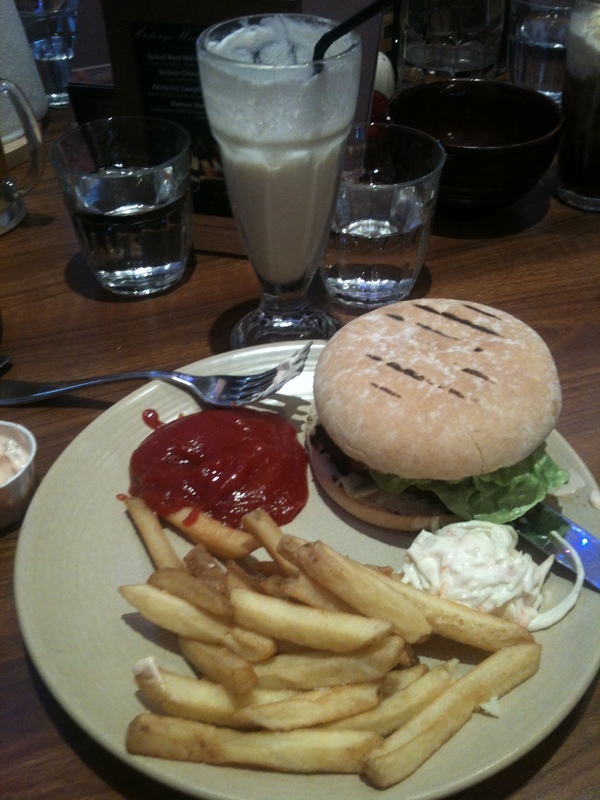 Overall it was a nice meal, and the staff were very friendly and surroundings nice, and the prices weren’t extortionate. I’m a sucker for american-themed food so I liked it! Anyone tried any great cafe’s or restaurants in Nottingham that I should check out? Let me know in the comments! Previous Post: « Stop what you’re doing and look at this! The meals look enticing and have been served in a presentable way. After reading this blog and looking at the photos I would definitely try out the Hickory’s Smokehouse restaurant when I happen to pass by Chester. I LOVE when you photograph food in 3 D. I mean it. 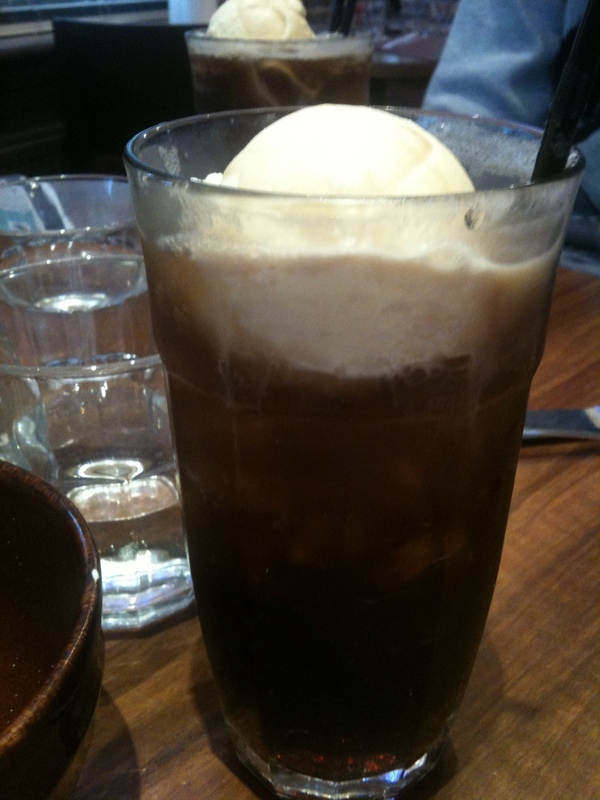 I’m in America and have never seen a root beer float look that enticing. There are many country places like that mostly up the Hudson (upstate New York) where you pull over and have this great lunch before continuing your journey. oh my days… this all looks utterly amazing! 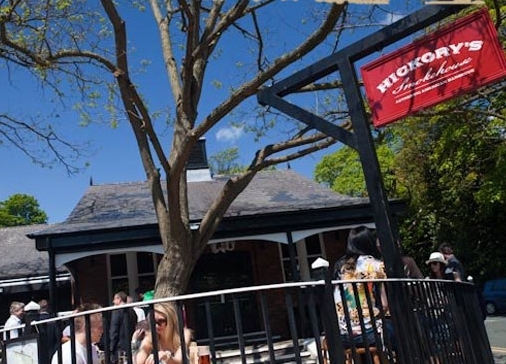 Hey Buddy!, I found this information for you: "Review : Hickory’s Smokehouse, Chester". Here is the website link: https://kerrycooks.com/review-hickorys-smokehouse-chester/. Thank you.